Where do private school students go to school? There are 34,576 private schools in the United States, serving 5.7 million PK-12 students. 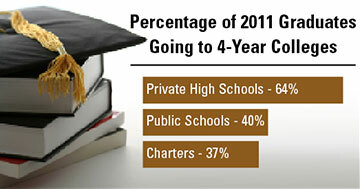 Private schools account for 25 percent of the nation's schools and enroll 10 percent of all PK-12 students. Most private school students (78 percent) attend religiously-affiliated schools (see table 2 of the PSS Report). 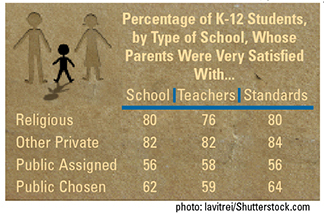 And most private schools are small: 87 percent have fewer than 300 students (see table 1 of the PSS Report). Source: Table 205.50 Digest of Education Statistics, 2015 Tables, National Center for Education Statistics. Visit the U.S. Census Bureau Web site for detailed tables on school enrollment for October 2015. Table 8 provides data by family income. In March 2000, the National Center for Education Statistics issued a report entitled Service-Learning and Community Service Among 6th- Through 12th-Grade Students in the United States. According to the report, "Involving America's students in community service activities is one of the objectives established under the third National Education Goal for the year 2000,which seeks to prepare students for responsible citizenship." The report notes a significant difference in levels of community service between public school students and private school students. "For both 1996 and 1999, students attending church-related private schools(42 percent for both years) and non-church-related private schools (31percent in 1996 and 41 percent in 1999) were more likely to say their schools required and arranged community service than students attending public schools...(14 percent in 1996 and 17 percent in 1999)." Visit the NCES NAEP Writing Web Site. Visit the NCES NAEP U.S. History Web Site. Visit the NCES NAEP Geography Web Site. Visit the NCES NAEP Civics Web Site. Visit the NCES NAEP Science Web Site. Use the NAEP Data Tool to develop customized reports. What do the achievement levels mean? Basic Level... denotes partial mastery of the knowledge and skills fundamental for proficient work at a given grade. Proficient Level... represents solid academic performance, and competency over challenging subject matter. The proficient level is identified as the standard that all students should reach. Advanced Level... signifies superior performance at a given grade. September 1, 2017 -- Americans rate private schools significantly higher than other types of schools, according to a Gallup poll conducted early last month and released August 21. 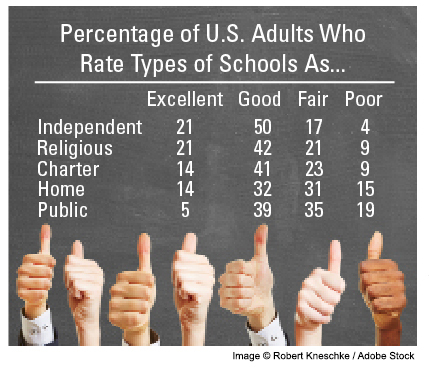 The survey of 1,017 U.S. adults aged 18 and older found that 71 percent of participants regarded independent private schools as excellent or good, while 63 percent gave the same rating to parochial or church-related schools. Charter schools received excellent or good ratings from 55 percent of American adults; home schools from 46 percent, and public schools from 44 percent. Read more about the poll in the September issue of CAPE Outlook. January 3, 2017 -- Private school parents are significantly more satisfied with the schools their children attend than are parents from other sectors, including public charter schools and public district schools. That finding comes from two new studies released by Education Next, a scholarly journal on school reform published by the Hoover Institution at Stanford University and the Harvard Program on Education Policy and Governance at the Harvard Kennedy School. The first study looked at results from a survey, commissioned by Education Next in May and June of 2016, of a nationally representative sample of 1,571 parents with children in school. The second study analyzed results from a survey of over 17,000 families conducted in 2012 by the National Center for Education Statistics (NCES). The second study’s larger sample size allowed for a deeper dive into population subgroups. Read more about both studies in the January issue of CAPE Outlook. November 1, 2016 -- If given the opportunity to select whatever school they could for their child, more millennials would prefer a private school than any other option, according to a national poll released October 11 by EdChoice, formerly the Friedman Foundation for Educational Choice. Asked “If it were your decision and you could select any type of school, and financial costs and transportation were of no concern, what type of school would you select in order to obtain the best education for your child?” 43 percent of millennials said they would select a private school (including independent, parochial, and religious); 28 percent would choose a regular public school; 13 percent, a home school; and 8 percent said they would choose a charter school. Read more about the poll in the November 2016 issue of CAPE Outlook. November 1, 2013 -- A central premise of the school choice movement is that parents know what’s best for their children. When they have a choice, parents tend to select schools that match their expectations of what a school should be. Making that match is a source of satisfaction. A new report from the National Center for Education Statistics confirms the fact that parents who choose their child’s school are indeed more satisfied with the school and its various characteristics than parents who are assigned a school by the government. Looking at data from the National Household Education Surveys Program of 2012 (NHES:2012), the report centers on parent and family involvement in education. Parents of 80 percent of students enrolled in a religious private school in 2011-12 and 82 percent of students in other private schools reported being “very satisfied” with their child’s school, compared to the parents of 56 percent of students in public schools to which their children were assigned and 62 percent of students in public schools that parents chose (e.g., charter schools and magnet schools). Higher percentages of private school parents than public school parents were also very satisfied with the teachers their children had and with the academic standards of the school (see table). Find out more about the study in the November 2013 Outlook . 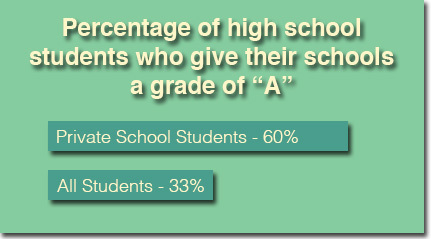 August 8, 2012 --Private school students are nearly twice as likely as students in general to give their schools a grade of "A," according to a national survey released today. Asked, “If you could give your current school a grade from A to F, what grade would you give it?” six out of every ten students in private high schools awarded their schools the highest grade possible, while one in three students overall did so. The 2012-2013 State of Our Nation’s Youth report, produced by the Horatio Alger Association of Distinguished Americans, covers the perspectives of young people on a host of issues. Some 1,500 individuals participated in the survey. December 1999 - By a margin of nine to one, Americans believe parents should have the right to choose their child's school, according to a report released last month by Public Agenda, a research organization based in New York City. 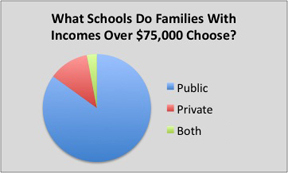 Moreover, if they were given a choice of schools-- along with the financial wherewithal to exercise it-- a full 55 percent of parents who currently send their children to public schools would want to send them to private schools. The report, titled On Thin Ice, presents findings from a poll taken to assess the public's attitudes on vouchers, charter schools, and related issues. The survey of 1,200 citizens, about one-third of whom were parents of school-age children, was bolstered by insights from five focus groups. May 2010: High Levels of Satisfaction Among Private School Parents. 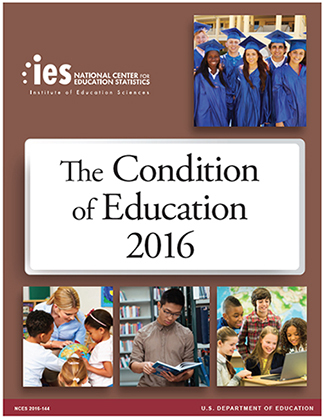 In May 2002, the National Center for Education Statistics (NCES) released its annual report to Congress on the condition of education. The report included a special analysis on private schools titled Private Schools: A Brief Portrait. Private school teachers are more likely than public school teachers to report being satisfied with teaching at their school. Private school graduates are more likely than their peers from public schools to have completed advanced level courses in three academic subject areas. Private school teachers are more likely than public school teachers to report having a lot of influence on several teaching practices and school policies. A majority of private school teachers express positive opinions about their principal and their school's management. On average, private schools have smaller enrollments, smaller average class sizes, and lower student/teacher ratios than public schools. Private high schools are four times more likely than public high schools to have a community service requirement for graduation. Students in the lowest SES quartile who attended a private school in 8th grade were nearly four times more likely to earn a bachelor's degree than students from the same quartile who attended a public school. Read CAPE's summary of the report. Download Private Schools: A Brief Portrait (PDF) directly from the NCES web site. June 1, 2016 -- The number of private school students increased from 5.3 million to 5.4 million between 2011-12 and 2013-14, according to a report just released by the National Center for Education Statistics. That change drove the private school share of all U.S. students from 9.6 percent to 9.7 percent. According to The Condition of Education 2016, “In 2013-14, some 38 percent of all private school students were enrolled in Catholic schools,” which accounted for 2.1 million students. Conservative Christian schools enrolled 707,000 students; other affiliated religious schools, 565,000; unaffiliated religious schools, 758,000, and nonsectarian schools, 1.3 million. Read more about the new report in the June 2016 issue of CAPE Outlook. 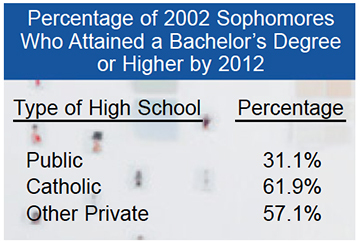 February 3, 2014 --With a college degree widely regarded as a ticket to success in life, it turns out that students attending private high schools are significantly more likely than other students to attain one. According to a report released in January by the National Center for Education Statistics, tenth-graders in private high schools in 2002 were nearly twice as likely as their public school counterparts to receive a bachelor’s degree or higher by 2012. In turn, degree recipients were ultimately more successful in securing a job and realizing higher earnings—considerable consolation in an economy scarred by persistently high levels of unemployment. October 3, 2011 -- A federal study following ninth graders through high school and into higher education and early work shows significant differences in achievement and expectations between the students in private schools and their counterparts in government schools. 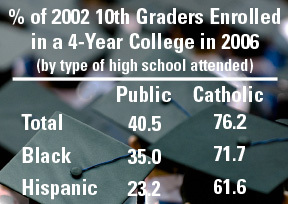 Two reports by the National Center for Education Statistics examine select characteristics from the base year of the High School Longitudinal Study of 2009 (HSLS:09), a massive project tracking a cohort of roughly 20,000 ninth graders in 944 public and private schools. The companion reports focus on the results of mathematics assessments, exposure to math and science courses, and students’ long-term educational expectations, while also offering contextual data provided by parents, teachers, counselors, and administrators. For more on this story and others, read the October 2011 issue of CAPE Outlook . Receive Outlook free of charge each month. September 3, 2013 -- Reports released this summer on two federal surveys provide, from an array of angles, a penetrating look at the state of private education in the United States. The National Center for Education Statistics (NCES) in August released selected findings from the 2011-12 Schools and Staffing Survey (SASS), a nationally representative survey of public and private school principals and teachers. The survey offers a rich assortment of information about schools, the people who run them, and the students who attend them. It turns out, for example, that 64 percent of graduates from all private high schools and 81 percent of graduates from Catholic high schools go on to a four-year college. The same is true for 40 percent of graduates from traditional public schools and 37 percent of graduates from public charter schools. Read more about SASS as well as the Private School Universe Survey (PSS), a comprehensive count of the number of private schools, students, and teachers in the United States, in the September issue of CAPE Outlook . April 3, 2013 -- Students in private high schools are more likely than those in public schools to receive a diploma, attend a four-year college, and ultimately earn a bachelor’s degree, according to data complied by the National Center for Education Statistics (NCES) at the request of CAPE. The findings hold true regardless of the race or ethnicity of students and should be of interest to policymakers determined to improve rates of high school graduation, college attendance, and college completion. Find out more in the April 2013 issue of Outlook . December 12, 2005--The National Center for Education Statistics (NCES) today released a comprehensive statistical analysis of the performance of private school students on the National Assessment of Educational Progress (NAEP) from 2000 to 2005. The report shows above-average performance of private school students in every grade, subject, and year tested. The report also examines student scores for various racial/ethnic groups, showing that Black students, Hispanic students, and White students in private schools outperform their counterparts in public schools. October 12, 2016 -- Call it a year of transition for the College Board’s SAT assessment. Some graduates of the class of 2016 took the old SAT, which was last administered in January 2016, and some took the new SAT, first administered in March 2016. The average total score on the old SAT for 2016 graduates was 1484 out of a possible 2400. However, scores varied significantly by the type of school students attended, with college-bound seniors in religious and independent schools scoring substantially higher than the national average. Read more about the scores in the October issue of CAPE Outlook. August 22, 2012 --If you graduated from a private high school this past June, you were significantly more likely than graduates of other schools to be ready for college coursework, according to data compiled by ACT, the college admission testing company. 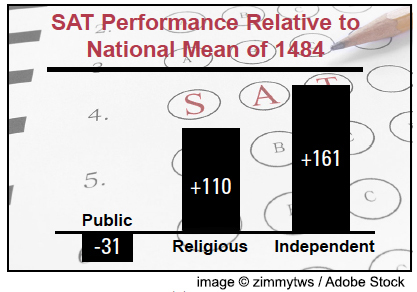 Eighty-three percent of 2012 graduates of religious and independent schools who took the ACT met or surpassed the test’s college readiness benchmark score in English, compared to 64 percent of graduates from public schools. The share of students who met the benchmark scores in other subjects was also higher in private schools (reading – 68 percent vs. 50 percent; math – 60 vs. 44; science – 42 vs. 29). The ACT today released a report titled The Condition of College & Career Readiness 2012, which summarizes the national performance of ACT-tested students. At CAPE’s request, the company compiled comparable data for private school graduates. 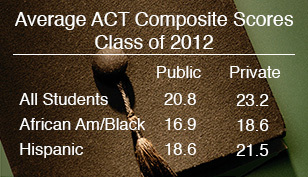 Average actual ACT scores for 2012 graduates of private schools were significantly above the national average. 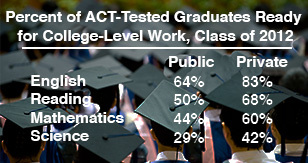 The ACT mean composite score for 2012 private school graduates was 23.2, compared to 20.8 for public school graduates, and the private school advantage remained steady across all subject areas: English – 23.5 vs. 20.1, reading – 23.5 vs. 21.0, math – 22.8 vs. 20.9, and science – 22.5 vs. 20.7. The ACT scoring scale ranges from 1 to 36, and seemingly small differences in the scale score can represent significant percentile shifts. For example, an ACT English score of 20 has a national percentile rank of 50 among all ACT-tested students in the class of 2012, meaning that 50 percent of graduates who took the ACT English test scored a 20 or below. But an English scale score of 24 places a student at the 74th percentile. In other words, a four-point scale difference on the English test represents, at least in this example, a 24-point percentile difference. 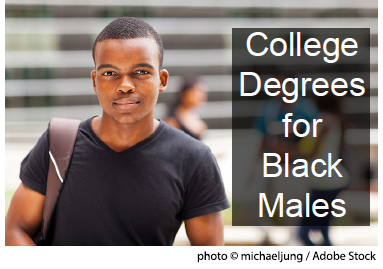 September 1, 2016 -- High-achieving black males who attend private high schools are dramatically more likely to attain a bachelor’s degree than similar students attending public schools, according to a study published in The Urban Review. Using data from the National Education Longitudinal Study (NELS:88/00), Dr. Valija C. Rose, the report’s author, looked at how high school types, settings, and programs affect the chances of certain students attaining a college degree. While controlling for socioeconomic status or SES (a variable combining parent education and occupation along with family income), Dr. Rose looked at the impact on getting a college degree of (a) school location (urban, suburban, rural), (b) school sector (public or private), and (c) educational opportunities (participation in gifted and talented programs or AP courses). Read more about the study in the September 2016 issue of CAPE Outlook. May 1, 2013 -- Students in religious schools enjoy a significant academic advantage over their counterparts in traditional public schools and charter schools, according to findings from a meta-analysis of 90 studies on the effects of schools conducted by William Jeynes, senior fellow at the Witherspoon Institute in Princeton, New Jersey, and a professor at California State University, Long Beach. The study also found that faith-based schools have narrower achievement gaps and better student behavioral outcomes. Read more about the study in the May 2013 issue of Outlook . April 6, 2007--What can be done to narrow the achievement gap? That question, in one form or another, has been challenging policy makers for decades. Grand national strategies, like the Elementary and Secondary Education Act, Head Start, and the No Child Left Behind Act, have been promoted by presidents and passed by Congress to help address the problem through expensive programmatic and instructional interventions. But what if the solution to the achievement gap is to be found in other domains, such as school culture, family support, or religious commitment? Jeynes drew much of his data from the massive National Education Longitudinal Survey (NELS:88), which tracked a nationally representative sample of eighth graders through high school and beyond. NELS:88 provides data on a host of school and student variables, allowing Jeynes to look at whether schools were religiously affiliated and to examine other factors like school culture, curriculum, race relations, discipline, violence, and homework practices. The student questionnaire enabled Jeynes to isolate students who considered themselves “very religious,” those who were actively involved in religious youth groups, and those that regularly attended religious services. He also examined other variables, such as test results, socioeconomic status, race, gender, and family structure. The NELS data showed that twelfth-grade religious school students in all SES quartiles achieved at higher levels than their counterparts in public schools, with the religious school advantage being highest for students in the lowest SES quartile. Religious school students in the bottom SES quartile had a 7.6 percent advantage in reading scores over similar public school students, while students in the highest SES quartile had a somewhat lower 5.2 percent advantage. Looking at achievement by race, Jeynes found similar results: higher overall achievement for both minority and majority students in religious schools when compared to their counterparts in public schools, but with minority students (i.e., African American and Latino students) enjoying an even greater religious school advantage than white students. For example, before controlling for gender and SES, black and Latino students scored 8.2 percent higher than their public school counterparts in reading achievement, while white students scored 6.0 percent higher than their counterparts. But even after controlling for gender and SES (see chart), black and Latino students outscored their public school peers in reading by 4.6 percent, while white students did so by 3.4 percent. With the achievement advantage among religious school students greater for low-SES students than high-SES students and greater for minority students than majority students, Jeynes concluded that both the SES and racial achievement gaps are narrower in religious schools than public schools. Turning to the more complicated question of why religious schools have a narrower achievement gap, Jeynes examined factors relating to school culture, family, social capital, and religious commitment. Although the methodology did not allow a determination of the cause or causes of the higher student performance in religious schools, the study offered some interesting candidates and correlations. Exploring the role played by school culture, Jeynes statistically examined five separate components, namely, school atmosphere, racial harmony, level of school discipline, school violence, and amount of homework done. According to the report, “The results demonstrate that religious schools outperform nonreligious schools in all of the five school trait categories and in nearly all of the individual questions that make up those categories.” The study also found that religious school students enjoyed an advantage over public school students in the three learning habits that were most strongly related to academic achievement: taking harder courses, diligence, and overall work habits.